Well, this is our last challenge for 2012, so looking toward to 2013, CD Sunday Challenge would like you to create a project as you 'Think of a Number'. I have made a birthday card for a one year old. 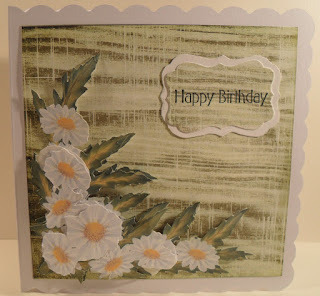 I used some pretty backing paper from Funkyhands Happy Birthday CD. A cute stamp which I coloured with Promarkers. 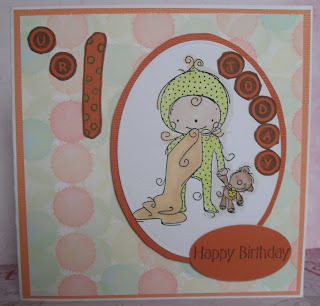 I also stamped out U R 1 TODAY and Happy Birthday using a mix of stamps. For those who will be celebrating the coming of the New Year I wish you all a very pleasant and fun time. Well, it's almost here, Santa is ready, the reindeer are getting excited, but we at CD Sunday Challenges are thinking of those folk who despite the expected arrival of Santa will also be celebrating a birthday, yes for this week we are All About Birthdays. This is Christine's choice, for which I say a personal thanks as my birthday is on 25th December, yes, Christmas Day. 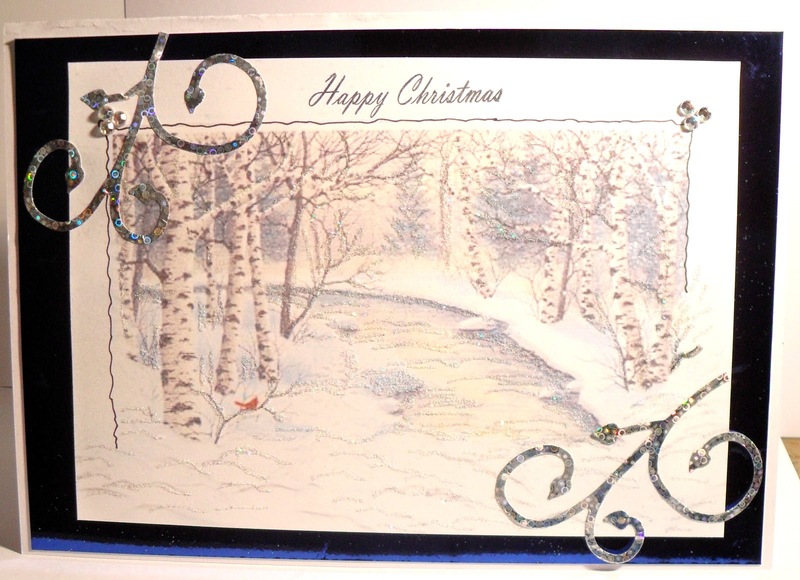 For my card, I first used Rob Adams CD - Fabulous Folds to make the main shape of the card. 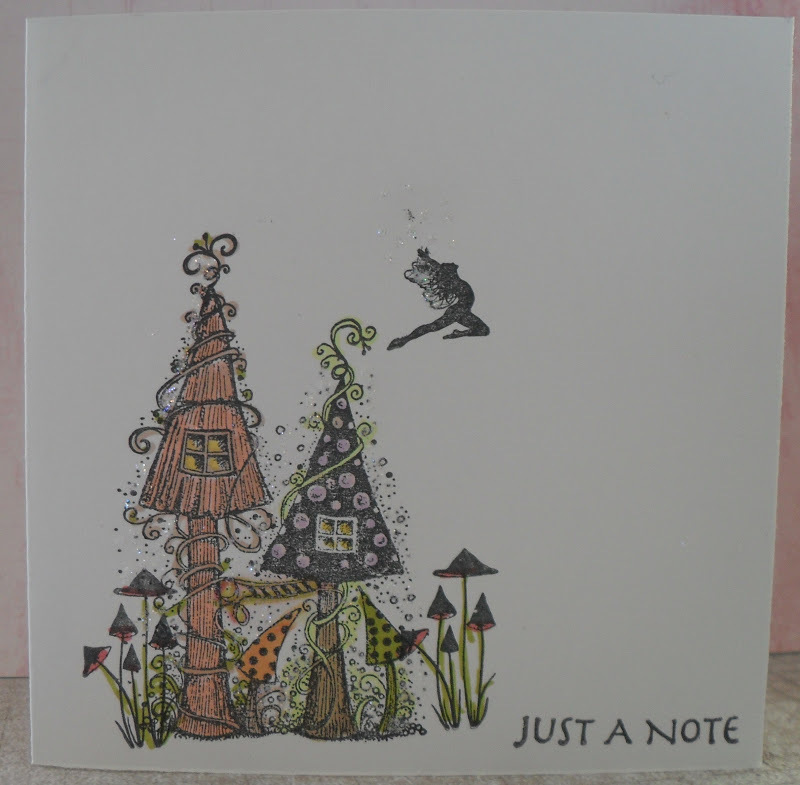 All the designed papers and greeting are from Crafter's Companions - Paintbox Poppets. 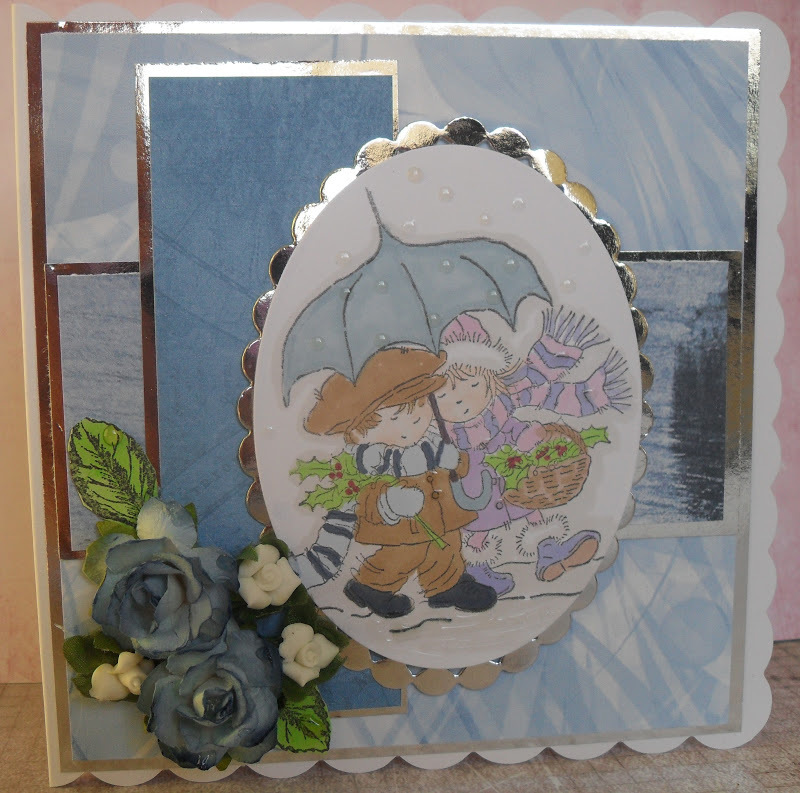 Embellishments added, a piece of ribbon, two roses with leaves and 3 card candy. Remember we do like to see something from a CD, it could just be a small embellishment or like me, the main part of your card. if you have time to join us, please have fun making your card. 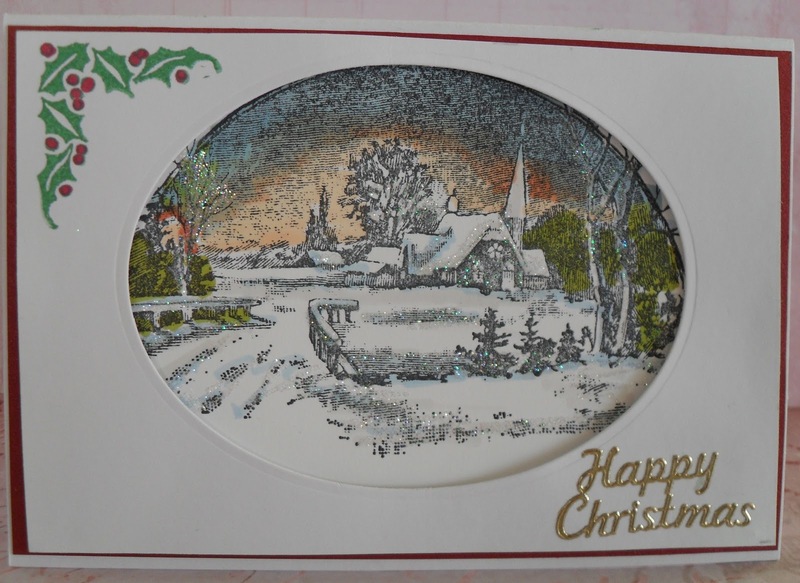 I wish all my followers who look in on this card a very Happy Christmas and for anyone who is having a birthday this week, I wish for you a very Happy Birthday. 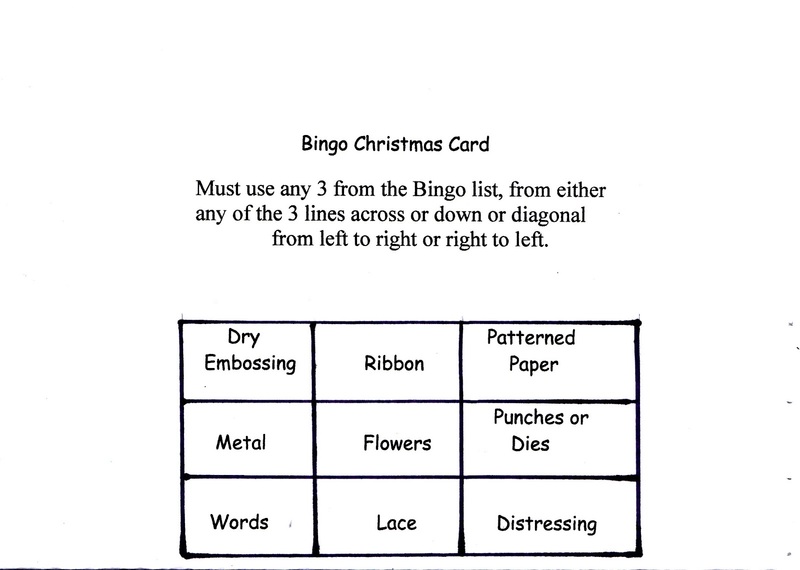 For my third week as the hostess at Make My Monday, I have chosen for the Pot Pourri month a BINGO CARD, however, we require and challenge you to make it with a CHRISTMAS theme. 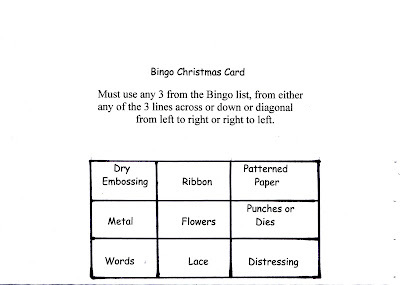 This is the card, you can use any line, in any direction. Have fun and for those affected by the cold weather please stay safe and warm. 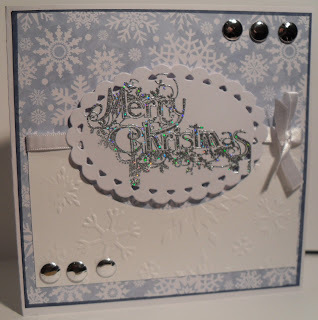 I chose the top Line = Dry Embossing, Ribbon and Patterned Paper, I have also used Heat Embossing, stamping and embellishments. Hello everyone, at CD Sunday Challenge this week Wendy P has chosen Teddy Bears, I wonder is there anyone who doesn't like Teddy Bears? Firstly I would like to apologise for not being able to visit and comment this past week, however, I will be able to do this later today. Life gets so busy at times but I offer not excuses, I will have double the pleasure. Once again the light here in the north of England is so bad, it dulls the photos. Honest it is much brighter in real life. 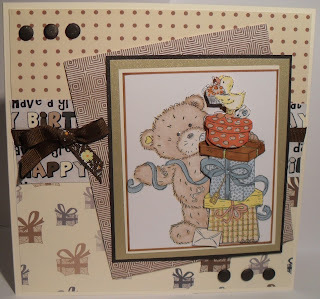 I have used papers from the Just 4 Men section on the Funkyhands - Birthdays CD I used a stamp of Popcorn Bear from Crafter's Companion. coloured him and his presents, Souffle the duck with Promarkers. I have added a second decoupaged layer of the presents and a 3rd layer for the top round box and Souffle. A little bling added with a Sakura glitter pen. I am also entering this into Here Come The Boys - Anything Goes - I am not sure whether Non-Christmas is acceptable, for mine is a birthday card. I understand if they choose not to accept. 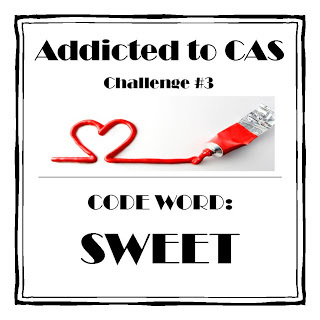 We at Addicted to CAS (Clean and Simple) were thrilled with the wonderful response for our first challenge, many thanks for your support, we hope we can continually interest you in our one word CAS challenges. For the next two weeks our challenge is as you see above SWEET, now we all know there are many variations of the use of this word, let us see what you are thinking of. Please check out the DT's inspirational work on the main blog. Here is my card, sweet for me means dessert or cakes. Kylie and the Design Team I would like to wish you all a very Happy Christmas, be safe and warm. Over the next two weeks, we will be commenting on your entries, please check out the details on the main blog. 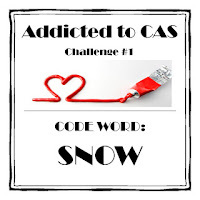 We will be returning with our next CAS challenge on 12th January 2013. 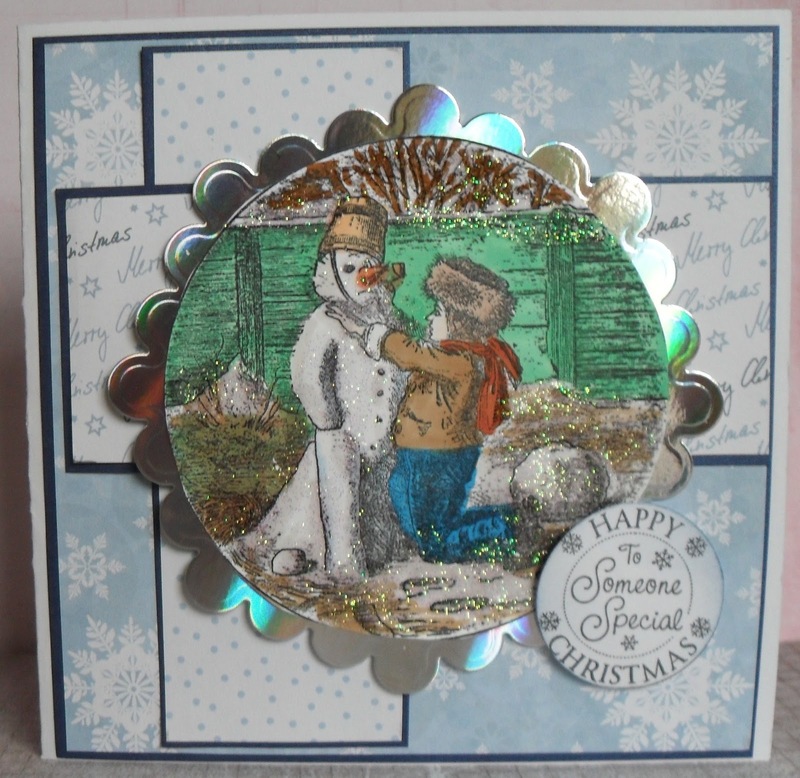 This month at The Stampman the challenge is a Winter's Tale, to depict showing either a winter sky, snow a snowy scene, all in the above card. 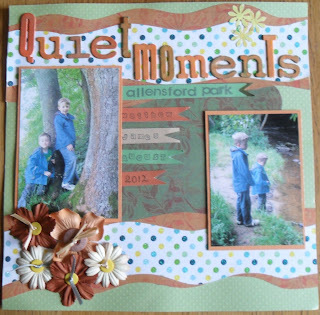 The main image is a favourite of mine and my class, we all adore this scene, which has been created with a La Blanche stamp I bought years ago from QVC. I have coloured all the areas with Promarkers, a touch of my Quickie glue pen here and there with the addition of Crystal Glamour dust to define the snow areas. Matted onto red paper, with a die cut front added. Please, to the purists forgive me for adding a peel off, needs must on occasion. The corner stamp is an old but trusted Clarity Stamp, possibly now classed as an antique. Happy Christmas to Jill and Ian, and all their trusty elves who bring us over the year so many wonderful creations. Over at Winter Wonderland their theme for this week is Oh! Christmas Tree. 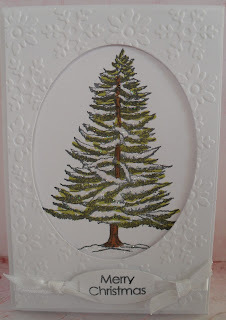 I stamped the tree from a Creative Expressions Christmas set created by Sheena Douglass, onto the front of the C6 card, coloured it with Promarkers, added Quickie glue pen and sprinkled it with Crystal Glamour Dust. 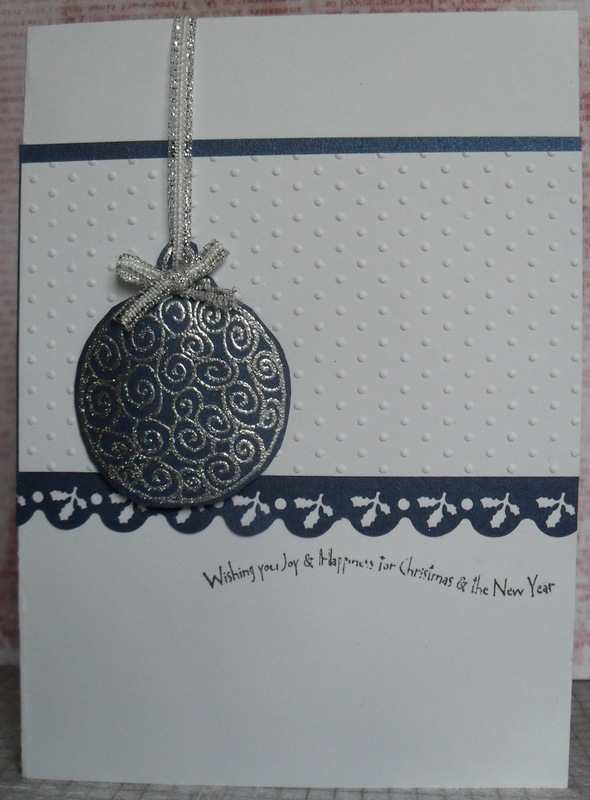 I embossed the front sheet of card, and used an oval die cut to form the aperture. Added the greeting tied it with white ribbon. 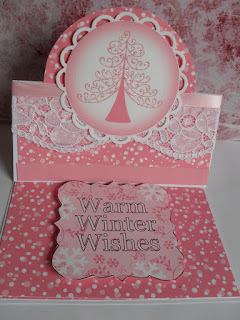 Here we are again, at Alphabet Challenge up to the letter W- which is Winter White chosen by Lesley. All the work has to be white. 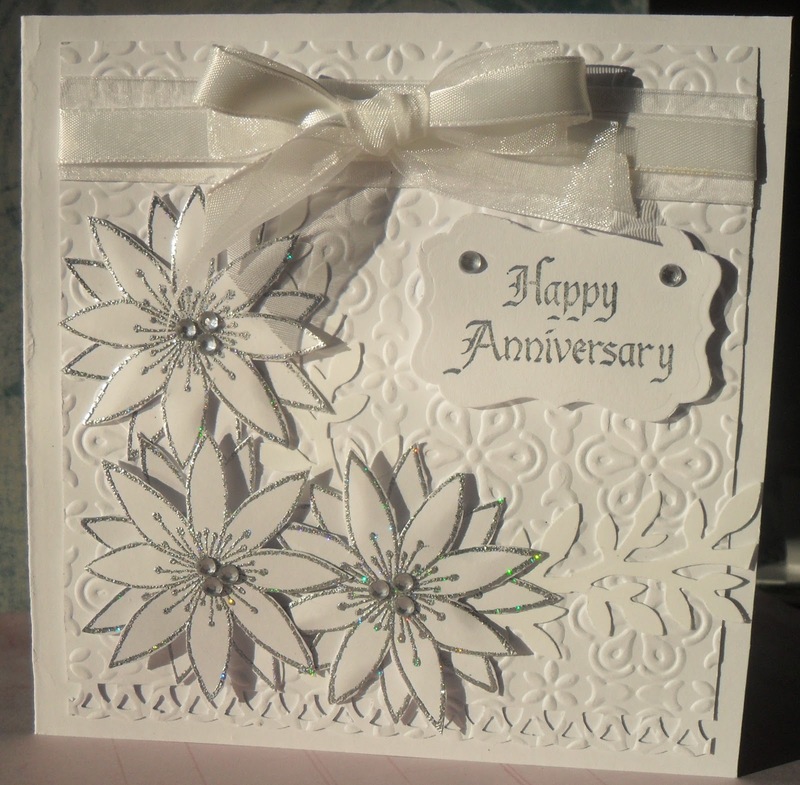 It doesn't have to be a card, if it is, it doesn't have to be Christmas, mine is for a Wedding Anniversary. I used a Spellbinders M-Bossibilities folder for the embossed pattern, secured a piece of organza and satin ribbon with a bow. 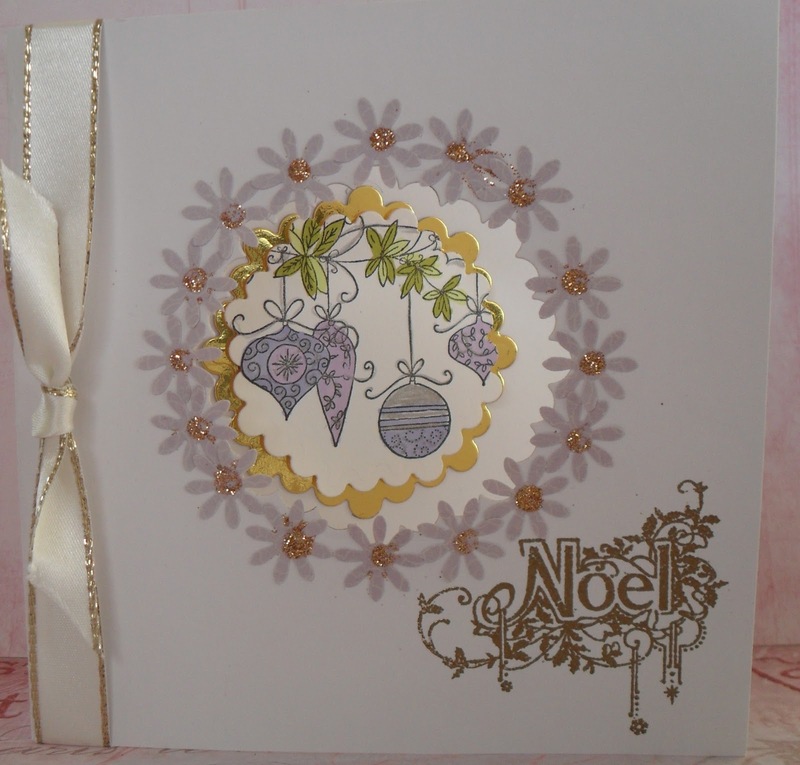 The flowers are from the small poinsettia flower by Chloe Stamps, heat embossed with Wow! Silver Bells E.P. The greeting is an old one from my stash. I look forward, once again in visiting your blogs. I hope you have fun and will try the challenge. Lesley and the Design Team will be popping in and commenting on your entries, but we are taking a short break for the Christmas holidays. We will be returning on Friday 4th January. 2013. 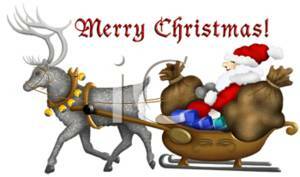 I wish everyone a very Happy Christmas to you and yours. This week at Addicted to Stamps and More it is time for us to have a game of Card BINGO. 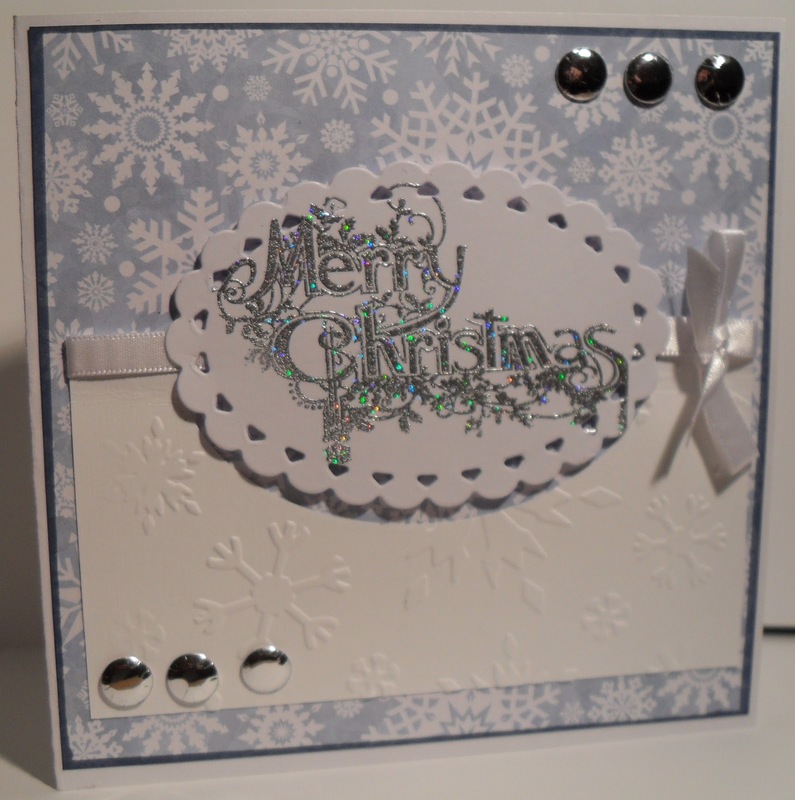 Stamps used - LOTV Bauble stamp in centre. 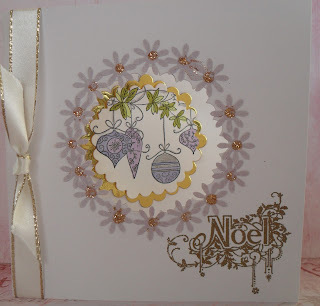 Noel from Katy Sue - Christmas Sentiments. Hello everyone on this cold, cold Frosty Day, what perfect timing from Beryl this week at CD Sunday Challenges. 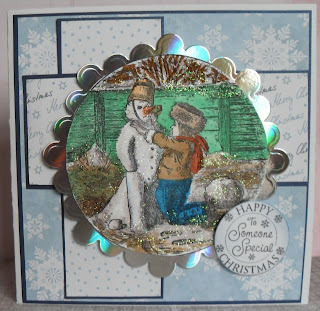 It is so cold, freezing at times, thank goodness we don't have the snow as in this picture from Maria G Designs - Christmas Scenes CD. Sorry about the picture, there is more cold blue, and it may be a little over-exposed in an attempt to lighten it. It has been so dark here most of the day. I added the scene onto dark blue mirri card, with a few gems in the corners and part of a couple of die cuts using a Marianne die. I am hoping when you click and enlarge you will see all of the glitter I have added to the picture. I look froward to visiting you all, to see your wonderful creations once again. Have fun ladies and please stay warm. I know how busy everyone is at present either making Christmas cards, or even out shopping for them. Hopefully you will get some time to enter the Favourite Flower Challenge over at Make My Monday. I decided for the mid week motivation to move to my second favourite flower which is a bluebell. 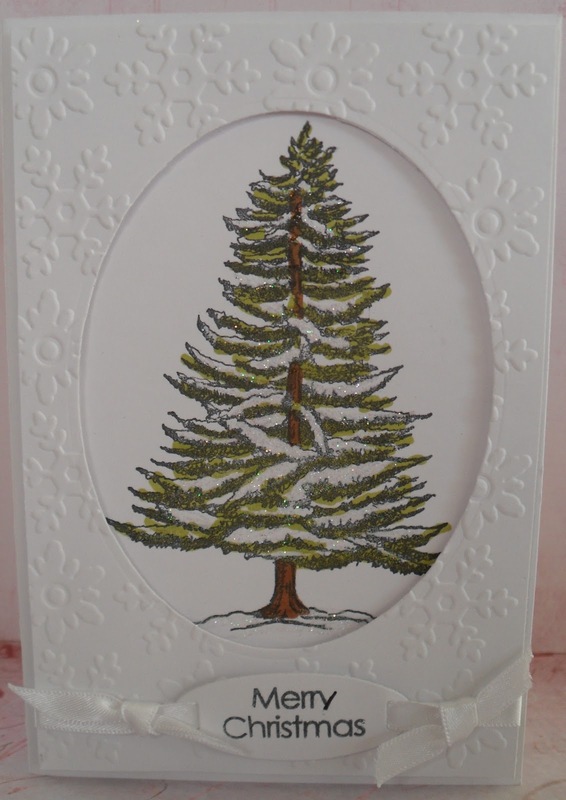 I have made an easel card and the additional inspiration in this post is I hope to encourage you to give a gift along with your card, by enclosing a bookmark. 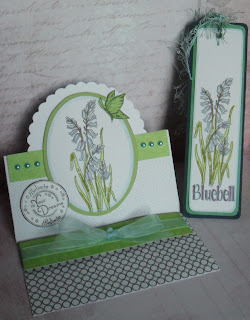 The stamp of the Bluebell is from Elusive Images (Chocolate Baroque). 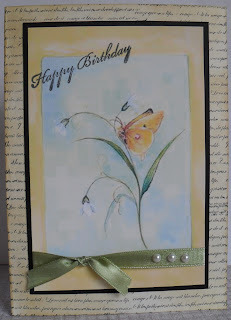 The butterfly is by Lyndsay Mason from her tattered Butterflies set. Coloured with Promarkers. background Papers from a pack by Papermania. Another chance to make a Christmas card or maybe not. At Addicted to Stamps and More it is time for us to give you the Make My Mark challenge which means, we would like you to use any colouring medium to colour your project/main image. Any form or type of marker is acceptable. 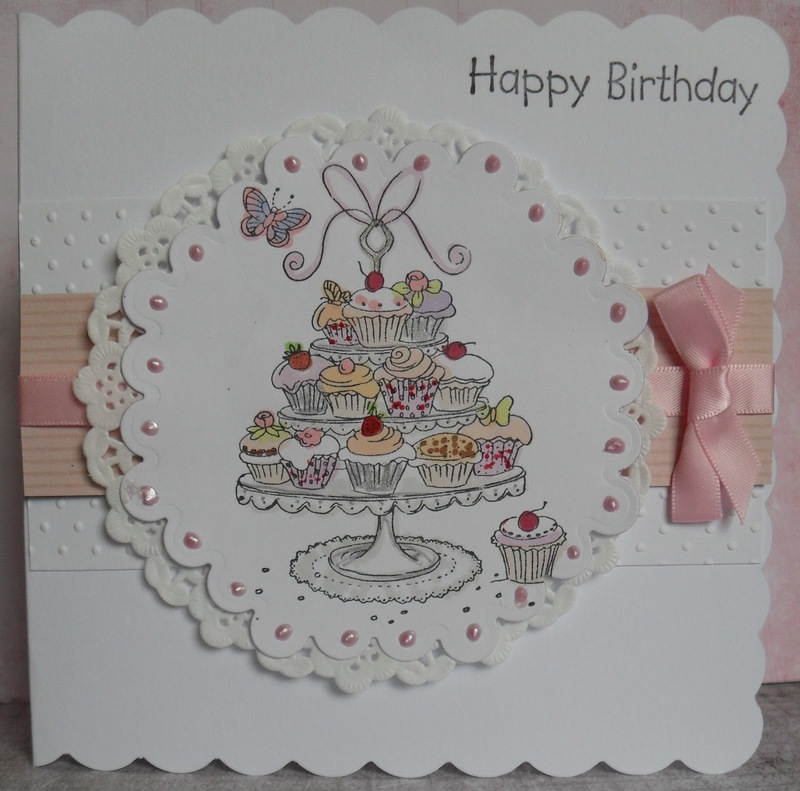 Please pop over to the main blog for detailed instructions and the rules, plus the Design team have once again produced a wide variety of cards to inspire you. Here is mine. 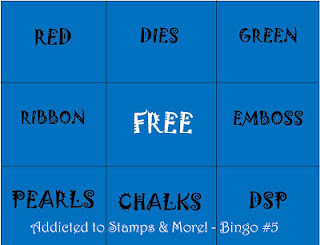 I'm afraid I can't name the stamp I used. A friend and I sat and swapped stamps for a Stamp-in Coffee Morning a few weeks ago, we had a great laugh but also had a very productive time. 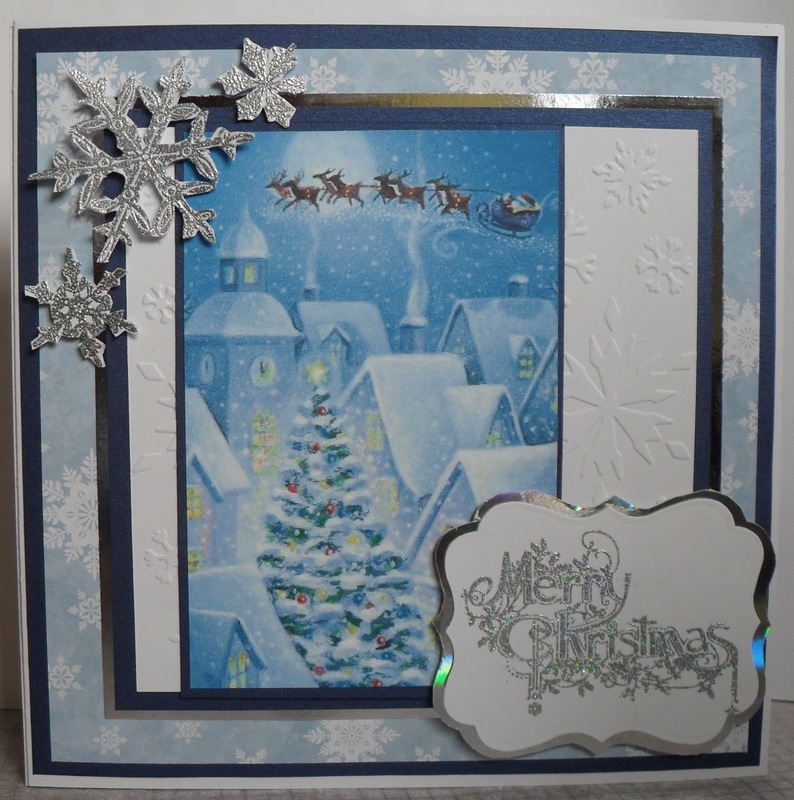 I added a snow embossed background. I coloured the main image with Promarkers, with a little help from a Quickie Glue Pen and some Glamour Dust to provide a little bling. I look forward to visiting you to see what you produce with the help of your markers. have a nice relaxing time. Hi everyone, well it's December and time for a new monthly challenge. It is my turn to choose the theme and weekly topics this month, some for Christmas, but we are starting with a Non Christmas Card, so the Monthly Challenge is called POT POURRI . During December there are many of us who have a birthday, so for the first challenge in December the team would like to see what is YOUR FAVOURITE FLOWER - Mine is a poppy, as I suspect are many others. It does seem to be a very popular flower, maybe you will prove us wrong. Remember it can be any project, not just a card, as long as you abide by our few rules. The Design Team and our guest designer have produced some wonderful samples to inspire you. I will also be back on Wednesday with a Mid Week Motivation. Here is my card. 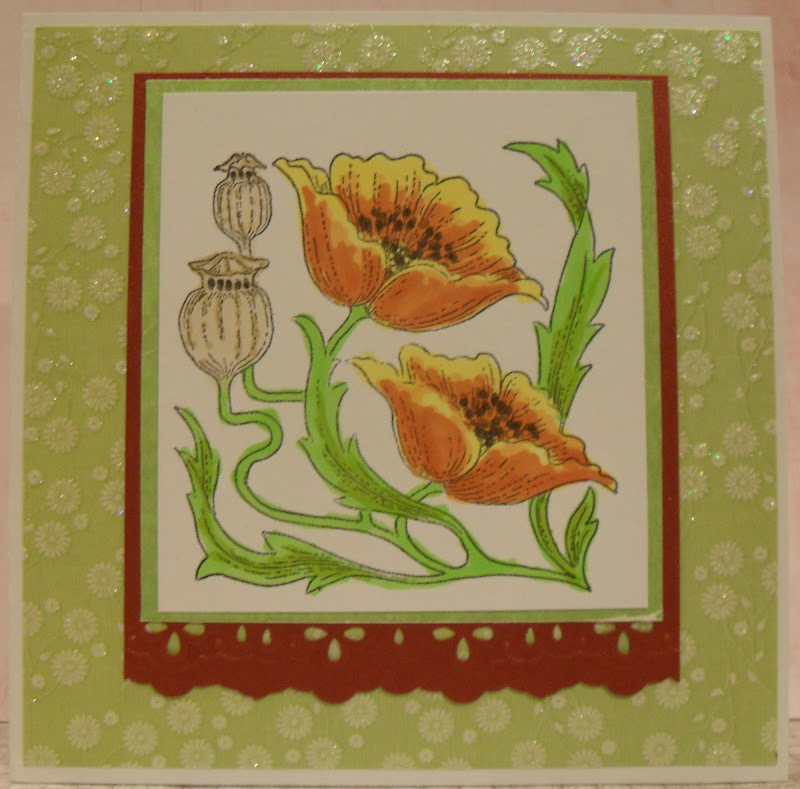 I cut the size of card I needed for the poppy panel, I have made many bookmarks like this. I coloured the background using a shaving type brush and TH Distress ink Old Paper. I then stamped the crackle effect to cover the piece. 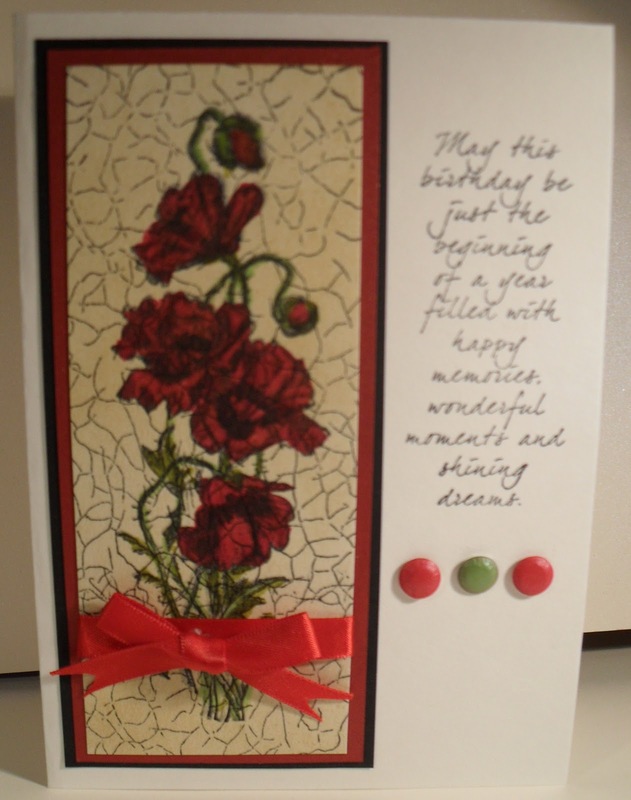 This is actually a short cut that I know works from past experience, because once you've stamped the poppy and water coloured the poppy using TH (Tim Holtz) inks you can't see the crackle lines on the poppies unless you get up close and personal. 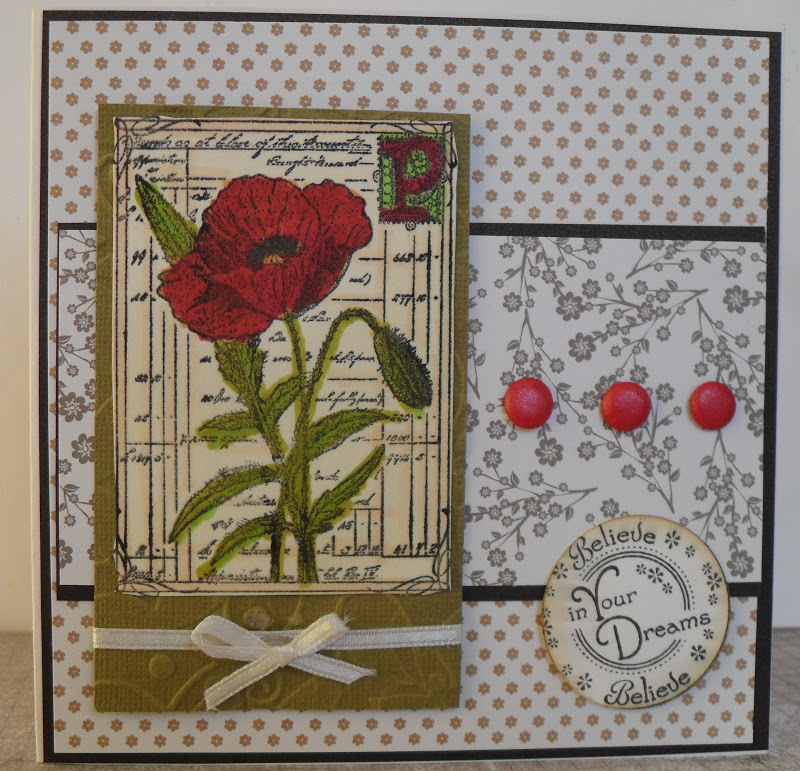 Otherwise you have to go down the road of stamping the poppy first, then making and using a mask, then stamping the crackle effect. etc. etc. The poem is from Elusive Images, embellishments are ribbon and card candy. I am looking forward to visiting you to see what is YOUR FAVOURITE FLOWER. who will provide the winner with a £10.00 voucher to spend in the on-line shop. So ladies, don't miss this opportunity of being in with a chance of winning yourself an extra craft delight. Once again the team have excelled in providing us with lots of super inspiration. Here is my card. Also entering into Try It On Tuesdays for Christmas Sparkle. A 5" x 7" card with an embossed panel called Swiss dots, a piece of dark blue paper punched. 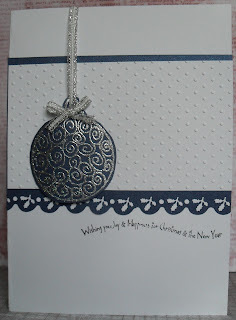 The Bauble is one from Chloe's Stamps, to see more of these baubles from last year's Christmas cards please go here and here, I embossed this bauble onto blue paper and used Silver Bells Wow! embossing powder. I love the swirly greeting which is from Crafter's Companion, have fun everyone, I look forward to seeing all of your CAS cards with the Code word BAUBLE. Isn't the year going fast? Or is that just me? Here we are at Alphabet Challenges - up to the letter V- Pat has chosen Vintage. Another excuse for me to make another Christmas card. It certainly is helpful getting my needed supply box filled. 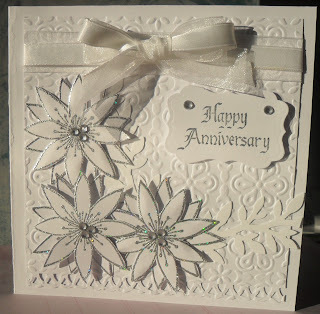 I have used a La Blanche stamp which I have had for many years but still enjoy using it. 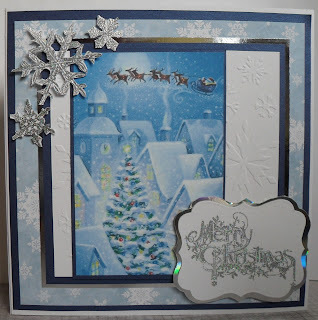 The background papers rather have a modern twist, they are from a LOTV Frosty Christmas Paper Pad. I coloured the main image using Promarkers, then added a lot of shimmery glitter glue. I am hoping this shows. Please do pop over to our main blog to see the lovely cards the design team have made to inspire you. For more information and inspiration please pop over to our home blog. Now for the sketch, remember as with any sketch you can twist it or turn it to any orientation your happy with. As you can see I am still making Christmas cards, not sure yet how many I have, but not worried if I go over my final number, any surplus will be given to the Salvation Army charity shop, for I greatly admire the work they carry out over the Christmas period and more besides. It's a 5" x 7" card, I have used papers from a LOTV Frosty Christmas Pad. 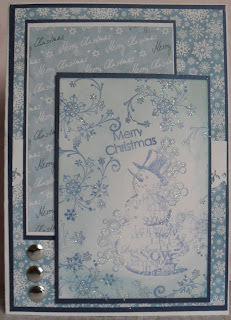 The front image has been created with an Inkadinkado Snowman and snowflakes, all stamped with a blue Brilliance ink pad. I'm not sure if the glitter shows but the front panel has lots of snowy glitter. I added 3 silver Card Candy to embellish. I look forward to seeing how you all create your project from the sketch. Already it is the last Monday in November, for Suzanne B's last challenge, at Make My Monday, she has chosen for you to use up some more stash with Buttons and Ribbons. 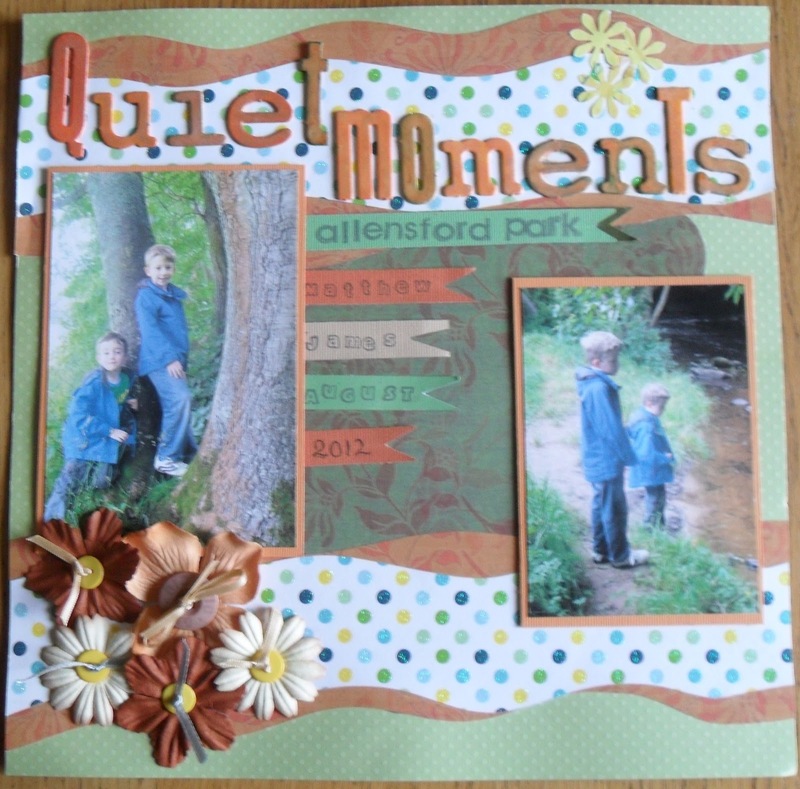 We often say we are open to all forms of projects, not just cards, so for a change I have created a scrapbook page with two of my grandsons. I am always more thoughtful about using flowers for boys but whilst they are this young I think I can get away with it. I added buttons for the centres of the flowers, through which there is threaded a piece of ribbon. They were both so reflective and quiet watching the water, a rare moment to be captured. It has been so nice to have Suzanne along with us again, our fellow past team mate, who I still miss. 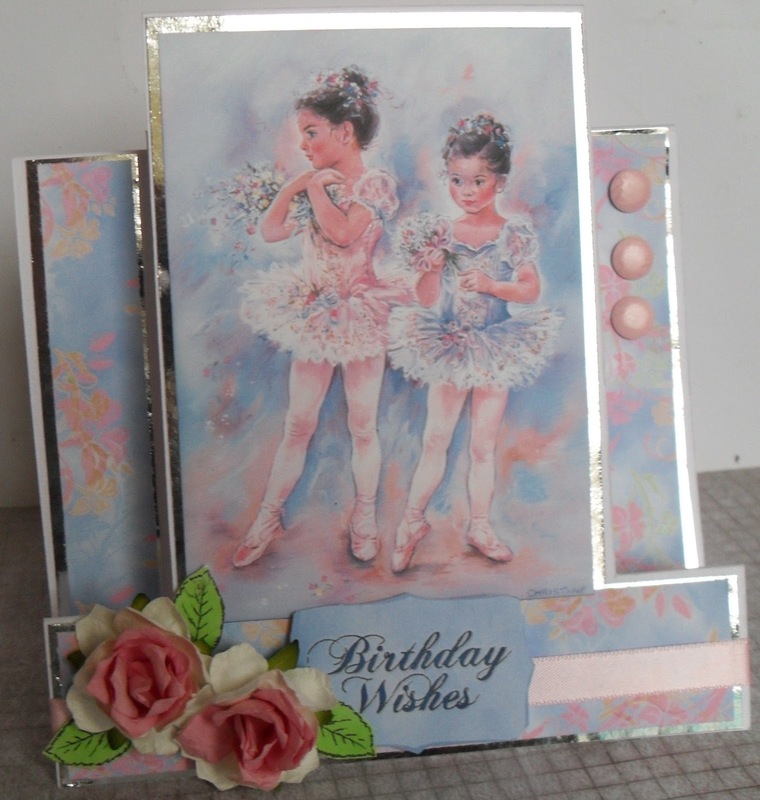 We have also been thrilled to have Avril - Mrs. B's Addiction along too as a Guest designer, she has created some wonderful samples for us, I hope we see you back again as a GDT. So ladies it is now your turn to create something for our challenge. 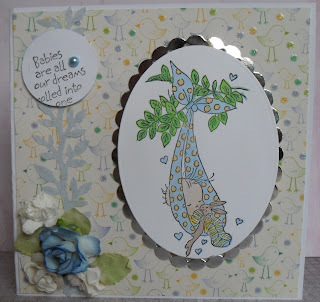 If you pop over to the main blog I am sure you will find some inspiration from the Guest designers and the design team. Once again I look forward to visiting you. Many thanks for the lovely comments you gave last week for my vellum card, which are greatly appreciated. This week at CD Sunday Challenges, the topic was chosen by Jocelyn - Inspired by Nature. Again a wide range of possibilities are here. Should I go down the Christmas card line again? No, I decided I wanted something without snow for this week. I choose this pretty image from Maria G Designs, from Victorian Nature a CD I purchased several years ago from E Bay, it has many copyright images depicting nature. I matted it onto a piece of black card. I coloured the main card with TH Old Paper DI then stamped text - from Creative Expressions -over it, to make it look like an old document. Added some ribbon and pearls. Stamped the greeting. 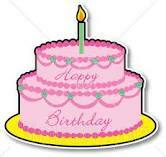 I do hope you like this very simple, but I think a card with a beautiful image. I look forward to once again visiting your blogs. Have fun. For their challenge this week at In The Pink, we are required to use punches /dies. This card qualifies for both. 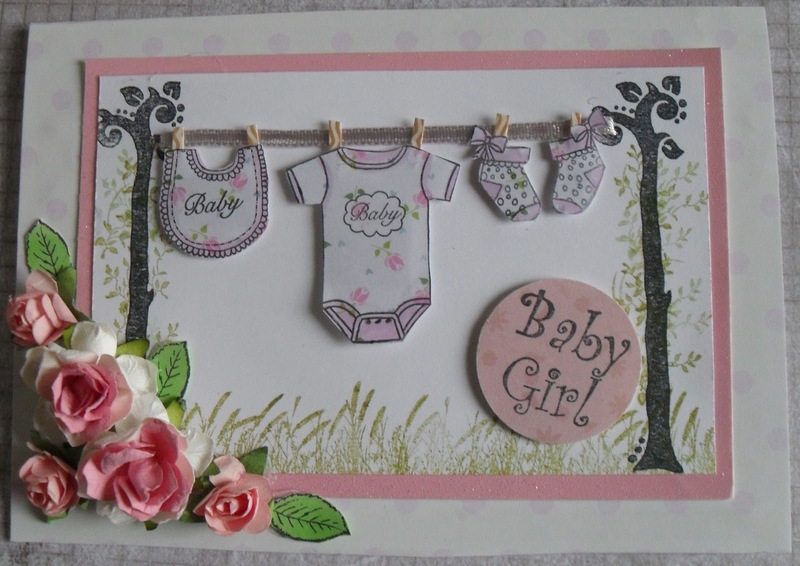 This is my last of the baby cards, which were made for my class. I stamped the beautiful baby from LOTV onto card, then used a die to cut it out. It is matted onto silver paper cut from a Marianne die. 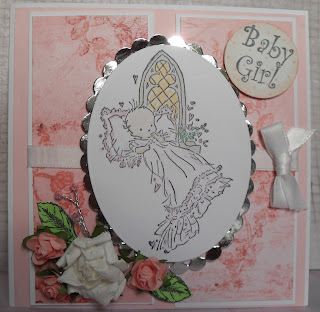 The Baby girl sentiment is from a stamp I bought forever ago, cheap as chips, then punched out with a circle punch. I used Promarkers to colour the image, dressed with white ribbon and some pretty flowers. 2nd entry today Friday 23rd. I have decided to enter a second card into the challenge at LOTV Thursday Challenges.- Anything Goes. I also made this card for the craft session for today. this is the most adorable stamp. Again this one is suitable for a baby boy, either for a welcome card, a Christening or Naming Day Card, an announcement of birth, whatever you wish. The sentiment is also by LOTV. Again coloured with a few Promarkers. 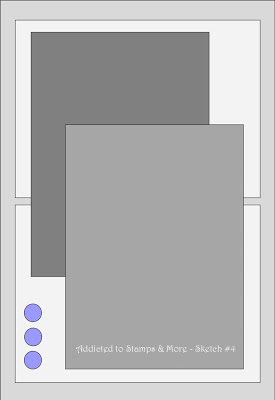 Background paper from my stash with two strips of white card added to look as though the background is in squares. At LOTV Thursday Challenges this week is Anything Goes. 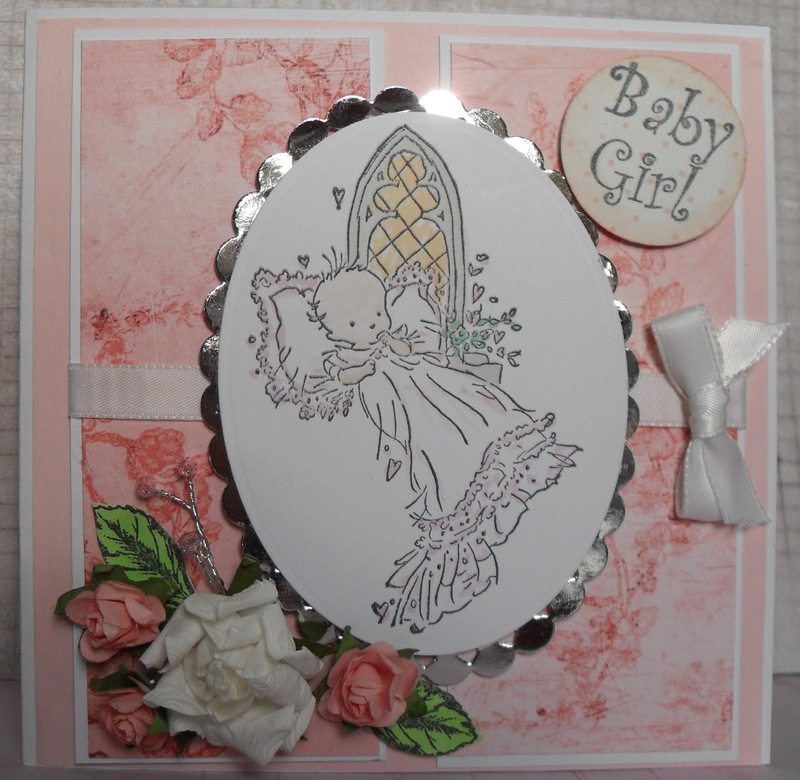 Here is another Baby card which I made for my class. The stamp is so sweet and easy to colour, I used Promarkers. The sentiment comes with this stamp. The background paper is I think, adorable, sadly I could only find one sheet at the last craft event I attended. The branch stem is from a Martha Stewart border punch. Hoping everyone in the UK is not too effected by the incessant rain we are once again experiencing. At My Time To Craft this week the challenge is New Baby. I am currently making some New Baby cards for my class on Friday, so thought I would just pop one in for the challenge. I have used a lovely stamp set from Stamps By Chloe, of a Onesie, Bib and Bootees. I stamped them onto a piece of paper from my stash with very small rosebuds on. I improvised the washing posts, using a branch from a bird set of stamps, used a grass stamp at the front and a leaf stamp from a Tapestry Peg stamp set. The Baby Girl, is a stamp I picked up forever ago for pennies and this is the first time I've used it. The main image is matted onto pink glitter card. The two larger roses are also available from Chloe, the three small roses are from E Bay. Maxed Out on Photos - HELP! I need some help and advice. I have had my blog for I think, two years, which as the time has passed has become more busier. I now find today, that I have reached my Max of 1 GB for photos, doesn't mean a thing to me, but it must be a lot in two years. I'm not complaining for a free service has been terrific, but I don't want to have to start paying per month for it, so Question is - What shall I do? Choice 1 = Start another blog - sending my new blog address to all I know. Choice 2 - Go backwards and delete as much as I can giving me more space. Anyone had this experience I would appreciate your comments. Thanks in advance. I do have some scheduled DT pics to go live soon so do need to make my mind up pretty quick. UP-DATE - After deleting almost all of 2010, my darling OH has insisted I pay the money, he is insistent it is my hobby and after all what is £1.94 a month compared to what I spend on stamps, I suppose that was what won me over. So I can now get up to 25 GB, that should last me out, he he !! The theme this week at Addicted to Stamps & More is CAS #4 (Clean and Simple). We are greatly enjoying visiting your blogs and look forward to viewing your creations. My card this week is from a set of notelets, I made for a friend, she has them now so I can start showing them on my blog. This is a favourite of mine, I love the Lavinia stamps bridge and the toadstools along with the flying fairy (or imp). I coloured the main image using Promarkers , added a small amount of colour to the fairy with a touch of crystal Glamour Dust. At Make My Monday during November we are asking you to continue the theme of AUTUMN - To use up your bits of stash and for this week, we would like to see some VELLUM. Please pop over to our blog to see some wonderful examples from the Design Team and to check out our few but essential rules. 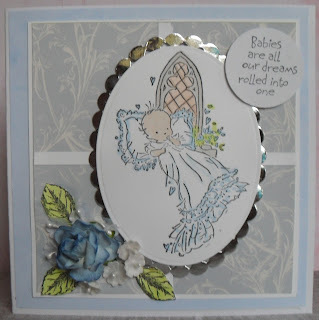 For my card I first created a coloured background with TH Distress inks . I then dried it, sprayed with water to get the diffused effect. Enlarge the pic and you will see all of the technique close up. I then sprayed with 3 mica sprays, Cosmic Shimmer Golden Fish, Desert Moon Spray - Horny Toad Teal and Sprinky's - Antique. Dried it all again. I stamped with Black Memento the ferns and grasses along with the seeded plant (?) from Indigo Blu. I stamped Sheena Douglass butterflies onto Vellum, then stamped again with a very small scroll stamp from La Blanche to provide a pattern. 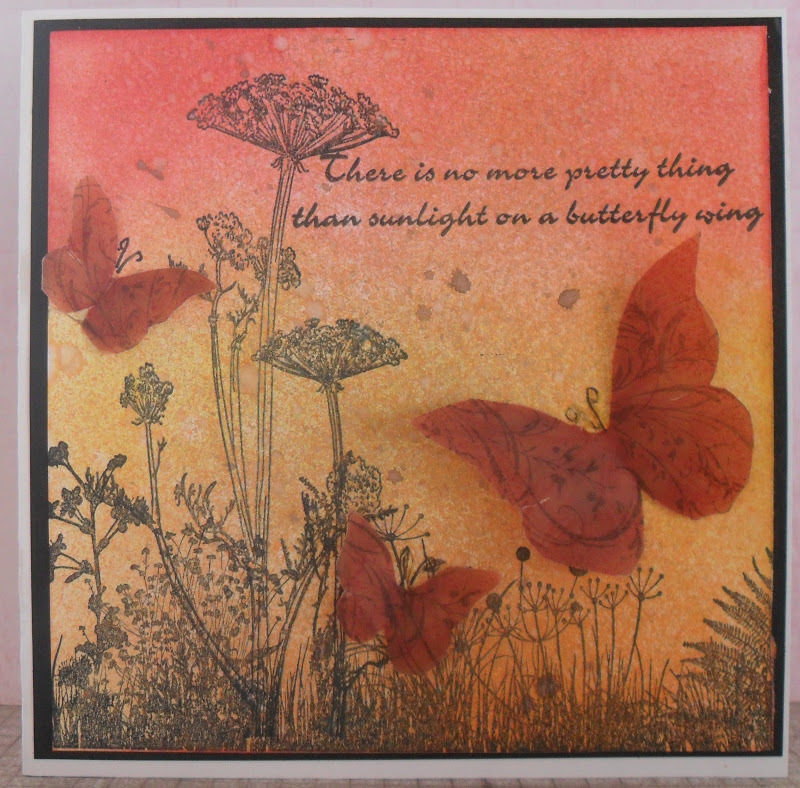 The sentiment is from Lyndsay Mason's tattered Butterfly set. Who says you can't mix up your stamps, for me it's remembering where to return them to after I have finished with them. 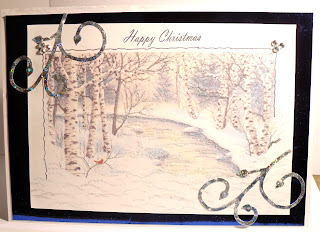 Not many seem to be enjoying this month's theme, I suppose it's because we are all making Christmas cards, I do look forward to those who have have made the effort to join us once again. Sundays do come around very fast these days, but I do enjoy the beginning of a new challenge at CD Sunday Challenges for the week ahead. This week we are asking for Layer It Up. Now when I first saw the title, I thought, right do I layer up the background with several backing papers, and a topper or do I go for an --age, so many to choose, decoupage, pyramage, invertage, twisted pyramage, I suppose you can call me an old fashioned girl, I went with decoupage from Sheena Douglass CD Paint Fusion. Now I know why, what I used to call intricate cutting is now fashionably called 'Fussy Cutting'. 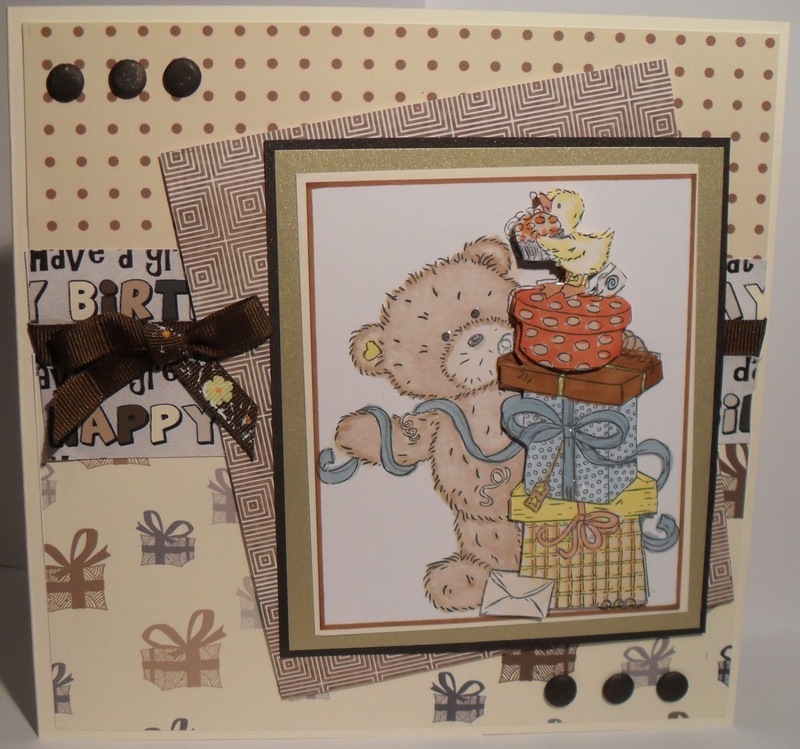 The greeting is a favourite stand by, the labels are from a new set recently purchased at a craft event. I look forward to seeing what you have chosen to layer up ladies (gents). who will give a prize of $20.00 (Australian) to the winner of the challenge. 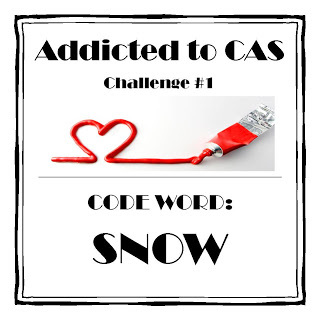 Please pop over to our challenge blog to check out the rules and to see the fabulous creations involving snow from the design team. I was inspired by Barbara Grey to make this card. I cut the strip to size and adhered it when it was completed, I wasn't brave enough to go direct to the card. 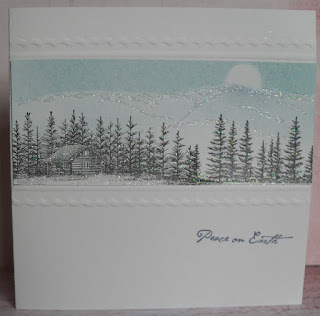 The sky, mountain line was created by inking onto the edge of torn paper, at the front I stamped the log cabin and trees and the tall trees to the right side of the card. I used a Quickie glue pen to create the marks on the mountains, then added Crystal glamour Dust. The embossing lines were added after the strip was adhered. Stamps used. Scenescape Log Cabin and trees. Embossed lines = Keepsake board. I look forward to visiting you over the next two weeks, please check on our blog before entering your card, we don't have many rules but obviously we do need to be fair, so need a few. Have fun. Hello everyone, this week at Alphabet Challenges we are up to the letter U - Vanessa has chosen for our title Under the Weather - (Get Well) - . 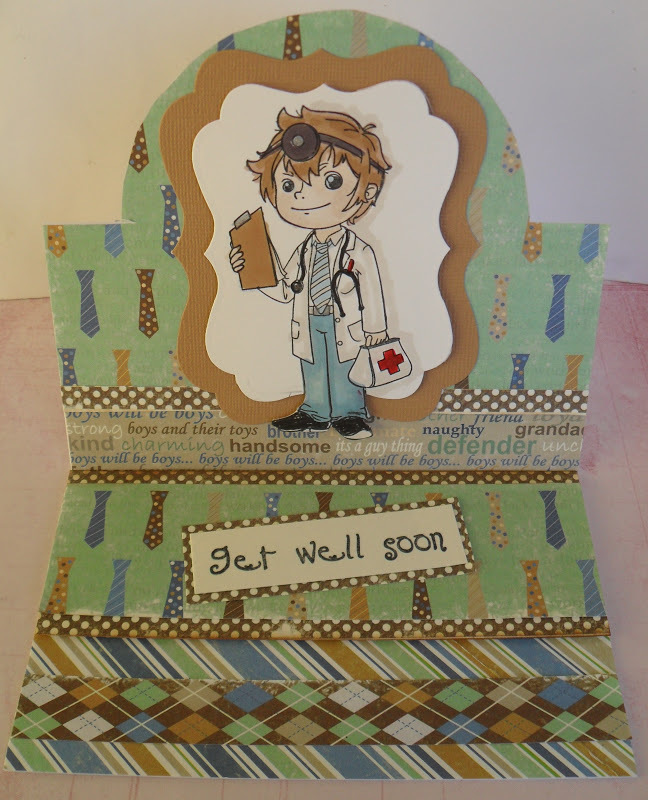 Sadly we all know many who at times need a get well card, not always for adults either. My card would do well for any aged male poorly person. A Doctor comes to call. I remember it isn't that many blog entries ago, I was shouting "I don't do Cute". Well, times do change and sometimes getting out of your comfort zone can be interesting and challenging. Last week at a craft event I was introduced to Lisa and Suzette at the Crafty Sentiments stand, within minutes I was hooked. The doctor, Dr. Toby, was one of a few I bought and I am waiting for new stocks to arrive for a few more. Thanks Suzette for explaining how to cut out of a die, I never quite understood it until you explained. I used Promarkers to colour the image. The backing papers, again I have had for so long I have long since lost the front sheet so have no idea of the source. Again I look forward to visiting your blogs to see your wonderful Get well creations. Have fun. 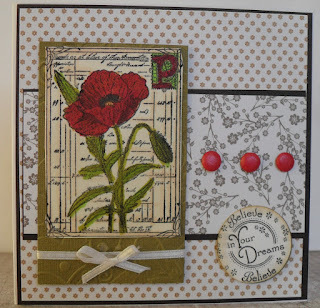 This week at Addicted to Stamps & More it is time for our colour addiction, which is Red and White. Of course it can be anything you wish, as long as your predominant colours are those colours required. I do apologise for the poor photo of my card, it has been so dull here from dawn to dusk, you can hardly tell what time of the day it is. The card is pure white, I assure you. I'll try again, as soon as we get a better day. For the upper part of the card I used a piece of paper from a freebie booklet with a magazine, the stockings are stamps from Debbie Moore. 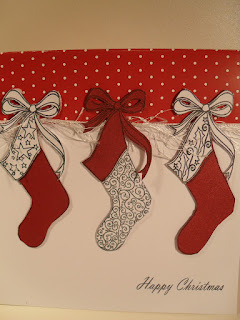 I stamped them in red and in white, then cut off the tops to swap them around to red and white. I look forward to visiting your colour addiction. We had some fabulous Flowers in last week's challenge, it's going to be very difficult to choose the winners. have fun everyone. 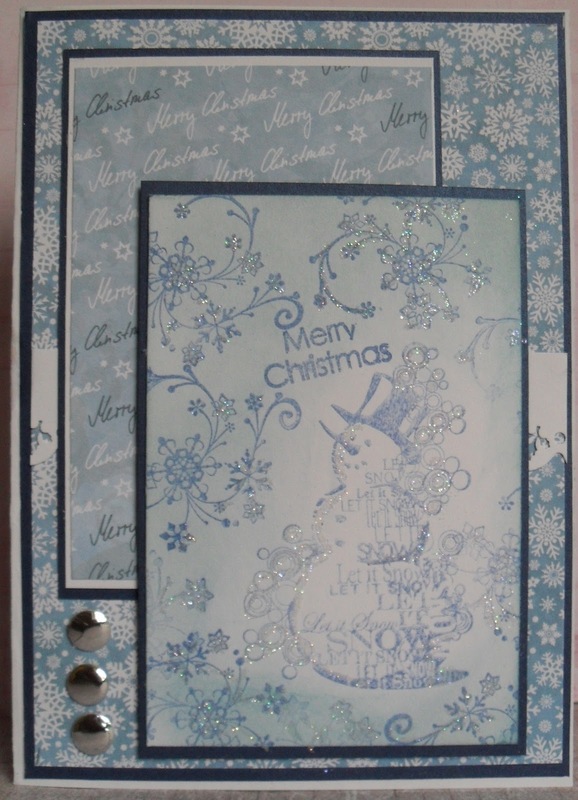 Labels: Addicted to Stamps and More, Christmas cards, Colour Theme. Hi everyone, this week at Make My Monday sees us into the second week of Suzanne B's choice - AUTUMN - the twist being to add some stitching, now this can be real, or it can be faux. I chose to draw on the stitching, I can hardly manage to thread a needle these days, even with those clever little needle threaders. The background paper is a sheet from an Elusive Images CD which a friend gave me a long time ago, proving, if you keep something long enough, you will use it. 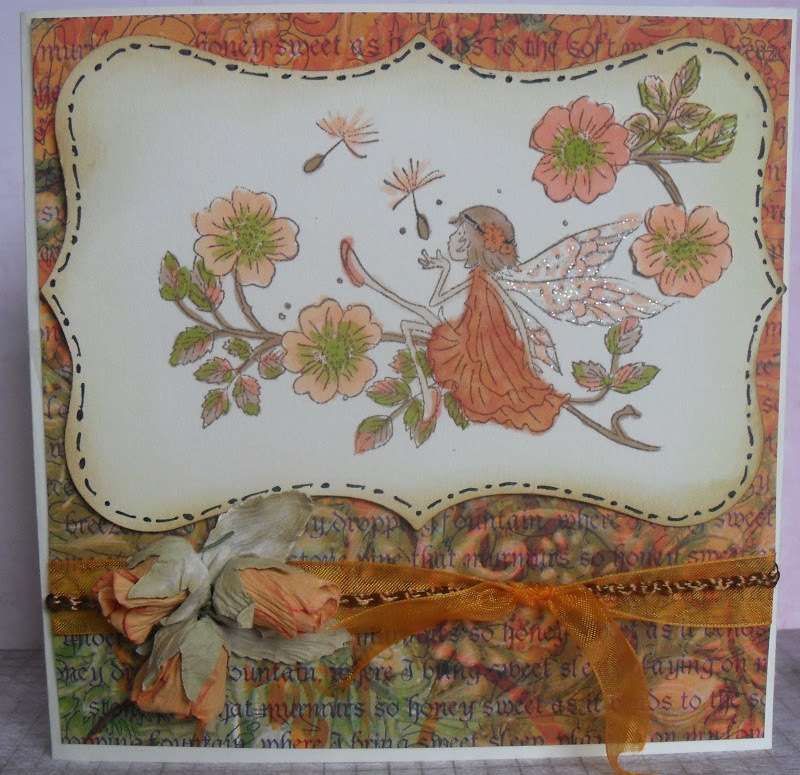 I stamped a LOTV Thistledown fairy onto a bought label. Coloured it with Promarkers, added a little glitter to the wings. Every fairy has glittered wings. Added some ribbon and cord for texture and three roses. I look forward to visiting your blogs to see your creations for this week's interesting challenge. 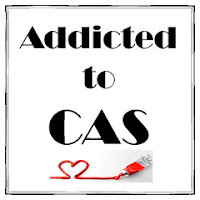 It's been a while since I had the time to enter into the wonderful CAS blog Less Is More. Congratulations to Mandi and many good luck wishes on your new venture of entering into the retail world. Welcome to Chrissie's new helper, Jen, I am sure you will have great fun working alongside Chrissie during Mandi's sabbatical. This week the theme is Houses - and it is One Layer Week, I actually prefer the one layer week, a case of stamp it and colour it. The houses and toadstools on each end are from Lavinia Stamps and the fairy is from Sheena Douglass Hidden Fairies set. The greeting is from a Hobby Art Greeting set. All coloured with Promarkers with the obligatory glitter for fairyland. Well we've had more than our (un) fair share of Rainy Days during 2012, now it looks like we will be having a long winter too in the UK. 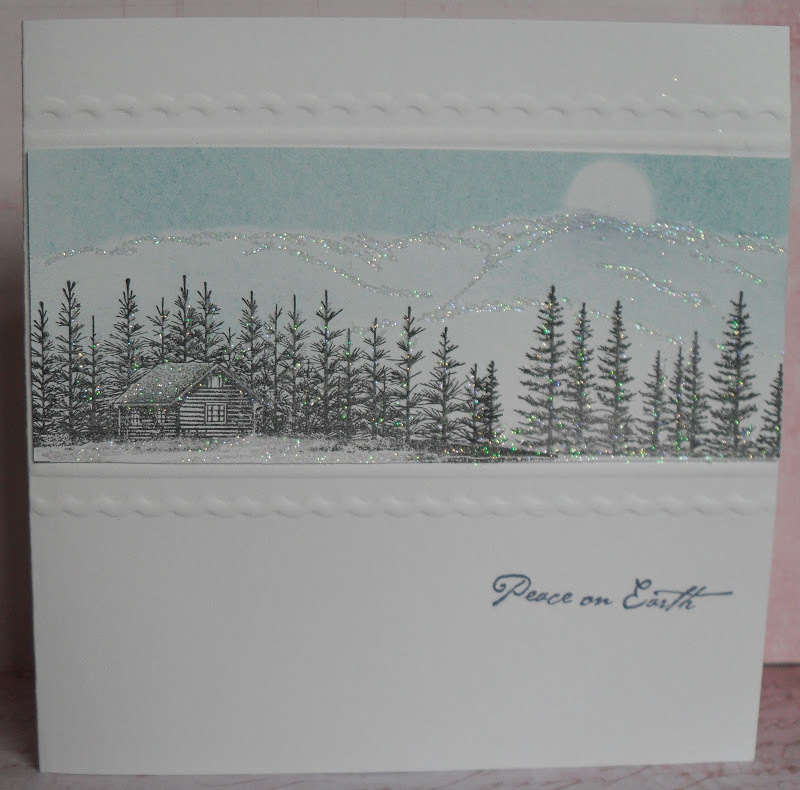 My card was I believe designed for snow, but what is snow, other than frozen rain, so I think I may get away with it. I have created many rainy drops with a drop here and there of Glossy Accents. The backing papers are all pieces of left overs from previous CD projects. I know I'm not the only one who holds on to pieces of card if it is above an inch square, thinking one day I'll use that. My aim during 2012 is to carry that ethos out to the letter. The pieces are from Painted Poppets CD, by Crafter's Companions. Sheena Douglass - Paint by Fusion and Debbie Moore - Shabby Chic - Haberdashery. I knew I'd use the left overs one day. LOL The stamp is from LOTV coloured with Promarkers. if you click on the picture to enlarge it, check out the flowers for they too have rain drops on them. I do look forward to visiting you for your cards always inspire me, I love to see what you have created. Have fun using your CDs. After discovering the Crafty Sentiments stand at the Nissan - Ross Papercraft Show on last Sunday, I have become a follower of the blog, for I thought their stamps were very good. Their challenge this week appropriately is Poppies, one of my favourite flowers, both for it's appearance and it's meaning. My entry is of an Elusive Images (Chocolate Baroque) poppy, which I used to demonstrate to my class how to use Promarkers for shading and mixing of colours. Would you like to win this Prize? New Clean and Simple Blog will start on Saturday 17th November 2012. 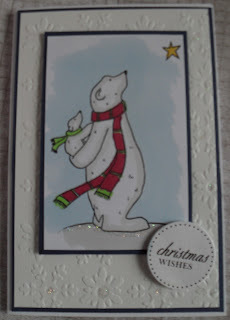 Crafts and Me are challenging us this week to make a RED card, of course this can be for any genre of card but any challenges I am entering into at present I am finding a way of making another Christmas card to complete my list. My background papers are a mix of freebies with craft magazines sent to me from a dear friend. The main image is LOTV Three Christmas Angels,they so cute. I watched a video tutorial on how to colour hair, I must say I am much more pleased with the results, than before I watched , so thanks again to LOTV. 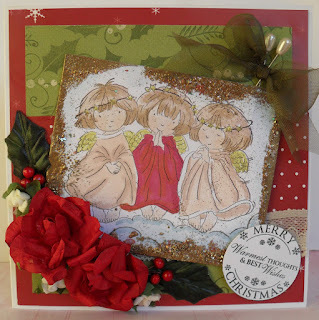 I edged the main image with a gold mix of Frantage embossing powder, glitters and flakes. Added the red flowers and other embellishments. Hello to my newest three followers, many thanks, I hope I will continue to provide cards you will enjoy. Here at Addicted to Stamps and More this week is our Theme challenge # 4 is Flowers. We all love flowers and they are so suitable really for every occasion, so we are expecting a lot of entries this week. You can make any project you wish, with any flower, using any technique, your not restricted at all. We so look forward to seeing your creations. For me, at this time of the year, my choice of flower is so suitable universally -for this challenge will be current on 11th November, Remembrance Day - which is why I have chosen a Poppy, the stamp is from Crafty Individuals, I coloured it with Promarkers. The backing papers are from a Papermania pad. 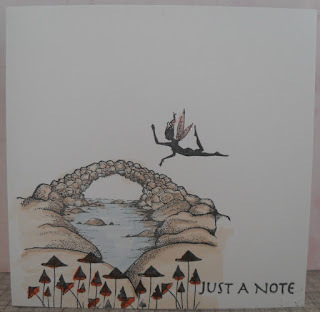 I stamped leaves on my Kraft card and rubbed around the edges with Pumice Stone and Black Soot Distress Inks. Tied with a piece of garden twine. To complete the rustic look, I coloured a piece of torn card from a box, which had been stripped of it's cover to show the corrugated area. 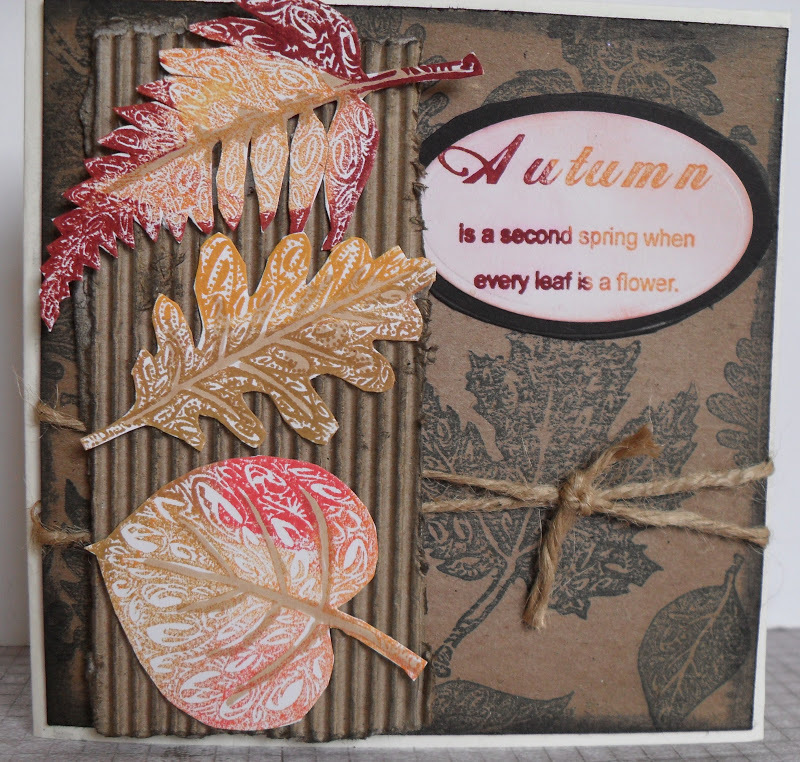 I then stamped 3 leaves from the Autumn leaves stamp set from Sheena Douglass. I used several DI direct to the stamps. Cut them out and placed onto the corrugated card. The sentiment is from the same stamp set. 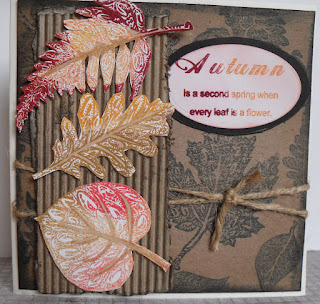 I look forward to visiting you to see your creations for our Autumn (Fall) - KRAFT & TWINE. Have fun everyone. http://www.dreamees.blogspot.co.uk/ who provided the Design Team with a selection of papers from their Christmas Memories CD for a Pink Christmas. 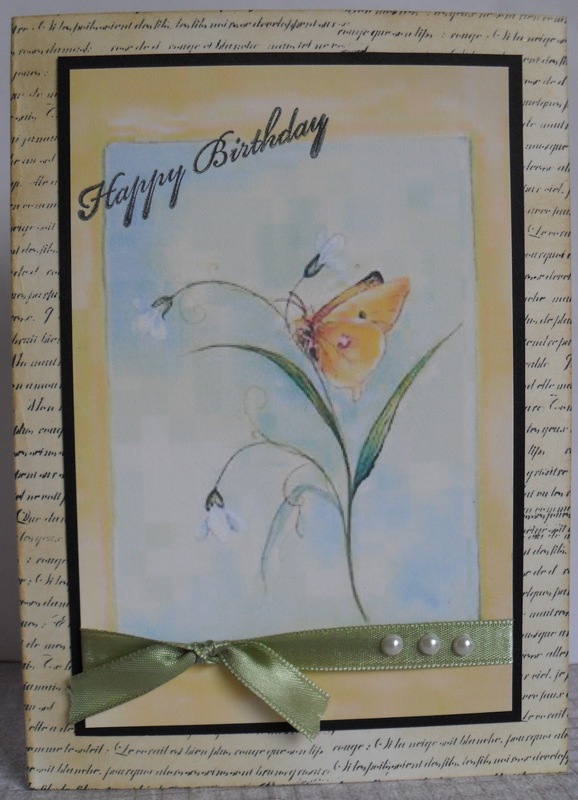 I made an easel card, covered in one of the beautiful backing papers. 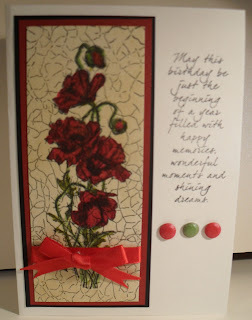 I used a Marianne Die for the topper, which I placed onto a piece of lace and ribbon to add more texture. Enjoy the challenge ladies (and any gentlemen) I look forward as to how you see Christmas in Pink.